How do you use my data? Who has access to it? How are you protecting it? Should I be worried about the government or facial recognition? How do we use the face scan data? Whenever you're being asked for data, whether it's a complicated face scan like we do, or simple locational data from your phone (which you'll notice we don't ask for), the prudent consumer wants to know why it's needed before granting permissions or sharing data. The fact of the matter is that we couldn't do what we do if we didn't have a way to scan your face. All the measurements of your head, of the glasses, of the detailed shape of your nose flow from the face scan. 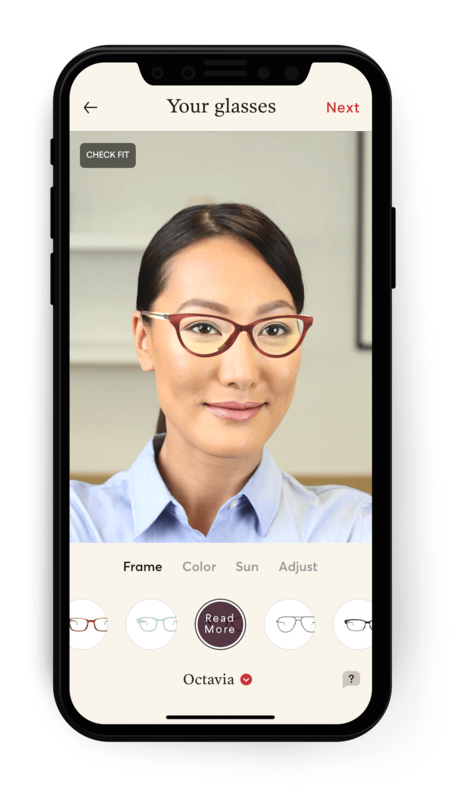 Other new custom apparel companies have relied on a tradition of tailors and standard measurements when it comes to building custom clothing, but there is no ecosystem of custom eyeglass measurements to lean on. Even if it was easy to find a spectacles tailor, there aren't good tools for measuring the angle your nose makes with your cheeks, or ear height relative to that-point-on-the-nose-where-the-bottom-of-the-nose-bridge-would-make-contact. There's really no way to do what we do (either previewing the product we'll build OR actually manufacturing it) without building this detailed 3D model. Who can access the face scan data? No one outside the company, full stop. Our business is manufacturing and selling glasses, not generating and selling data. We will NEVER sell your face data to another party. Within the company, access to the data is given on an as-needed basis. Only employees involved in helping customers select a design or in building the glasses ordered can can access individual customers' data. How does Topology protect your data? Face model data is stored on password-protected servers hosted by Google and Amazon, both of whose web services are considered safe enough to store and transmit private health record data and financial data--two types of data which are covered by the most stringent privacy regulations. Further, casual users of the app are protected by anonymity (you'll notice you're not asked to sign in to the app with credentials at any point). No one can link a face to a name or email until a pair of actual custom glasses is purchased. Apple goes through great trouble to ensure that app developers like us know nothing about you until you share data explicitly with them, and we have no interest in angering our friends in Cupertino. Should I be worried about the government or facial recognition? No. Quite aside from the fact that (1) you're anonymous until you choose not to be, (2) we don't externally share your data, and (3) we and our technology partners go through great lengths to protect your data, the data we generate is not terribly helpful to anyone who's not making custom eyewear. We're not capturing data that's any more intrusive than a series of photographs (so if you have a social media profile, there's nothing new we're capturing that you haven't previously publicly shared). Once we process the photographs, we're only generating high-fidelity 3D models for the areas of your face relevant to making glasses. As a result, the 3D model we have of your face would likely not even be useful for facial recognition, if some nefarious third party did hack Amazon and get your data, which is a pretty unlikely scenario. Long story short, there's not much to be concerned about on the data and privacy front. If you want to know more, you're welcome to reach out and ask. And if you want to be double- or triple- safe, we'll be happy to delete your data from our system upon request.